I don’t know when I fell in love with tea but it definitely happened. When things get chilly, rainy, or stressful I reach for a hot cup of tea. I even start every morning that way, whether it’s a blustery winter day or one of those 90°F by 9 o’clock kind of days. I love tea. When I’ve just woken up or I’m getting ready to tackle a big project I opt for black tea with almond milk and a teaspoon of sugar. When I’ve just started to feel under the weather I hurry out the door to forage my own pine needle tea or take some multiflora rose hips off the shelf. If I feel nauseous it’s mint tea time. I could go on and on. I’ve started growing, foraging, or buying bulk tea for just about every occasion or ailment. Except for mental health. While you’ll definitely find me clinging to a hot cup if anything goes south, I’ve never tried drinking teas that help calm and relax. Usually I just start sipping black tea which isn’t really the perfect choice for managing stress. The caffeine and sugar combo has the opposite affect and can make stress and anxiety worse. While adding more herbs to my “to-grow” list isn’t really in the cards this year I did manage to find a loose leaf, calming herbal tea I adore. It’s now my go to for those crazy afternoons when I feel like I just can’t handle any more project deadlines, from scratch meals, animal emergencies (there really is more of those than you’d think), or farm chores. On days when things just seem like too much I’ve been trying to take 5 with a cup of Rose City Repose by St. Fiacre’s Farm. This experience has reaffirmed my belief that herbal remedies really do work! 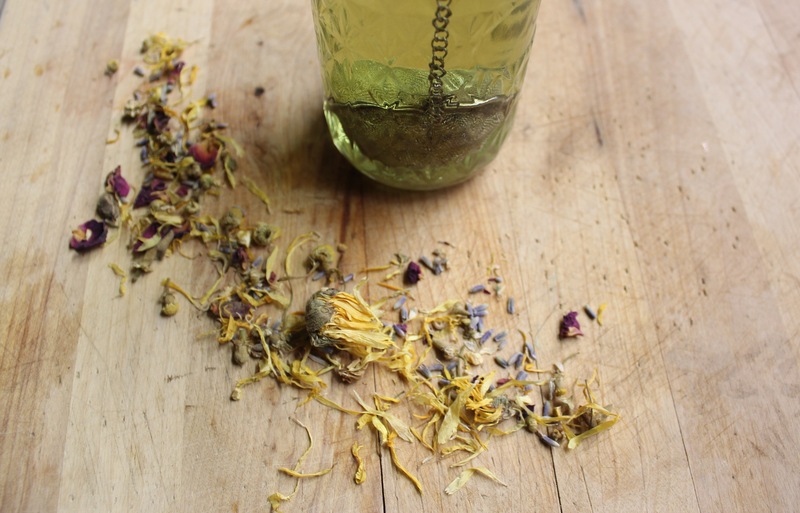 Rose City Repose is made from just a few awesome ingredients, calendula, lavender flowers, chamomile, rose petals, and orange peel. 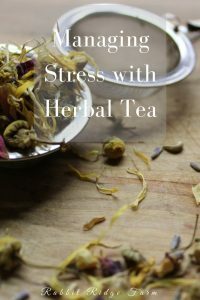 While these certainly aren’t the only medicinal herbs that can be used in a calming tea they are great choices. Just the scent of lavender is enough to put many people at ease so it’s no surprise it’s a main ingredient in this calming herbal tea. Lavender is believed to help treat insomnia, as well as anxiety and depression. Chamomile is one of those awesome medicinal herbs that’s some how managed to maintain widespread use. There’s few grocery stores that don’t stock at least a box of or two of chamomile tea which is often marketed as a sleep aid. While chamomile tea can be used to promote sleep it’s a real powerhouse with a range of benefits. 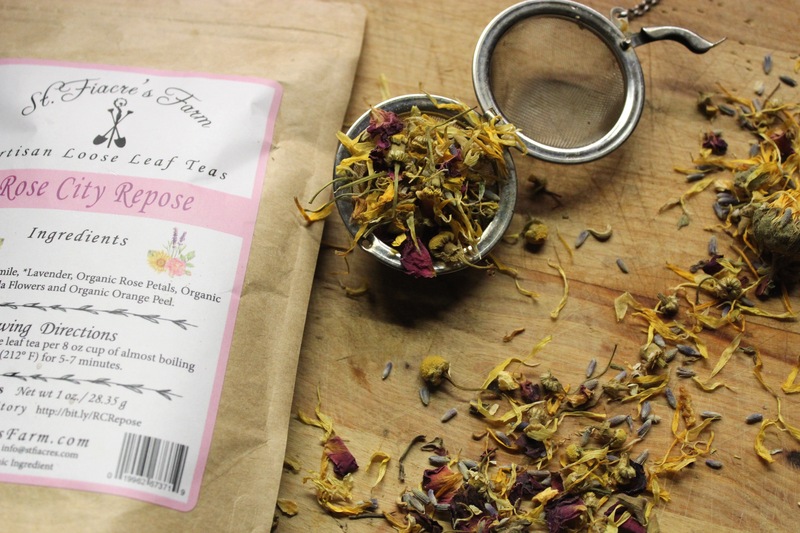 For my purposes I love that chamomile is in Rose City Repose because it’s been shown to boost immune health and reduce anxiety and depression. Aside from being gorgeous rose petals are also mildly sedative, perfect for when life gets a little too intense. They also have the added benefits of being anti-inflammatory and high in vitamin C which can help you stay well even when you’re dealing with a lot. 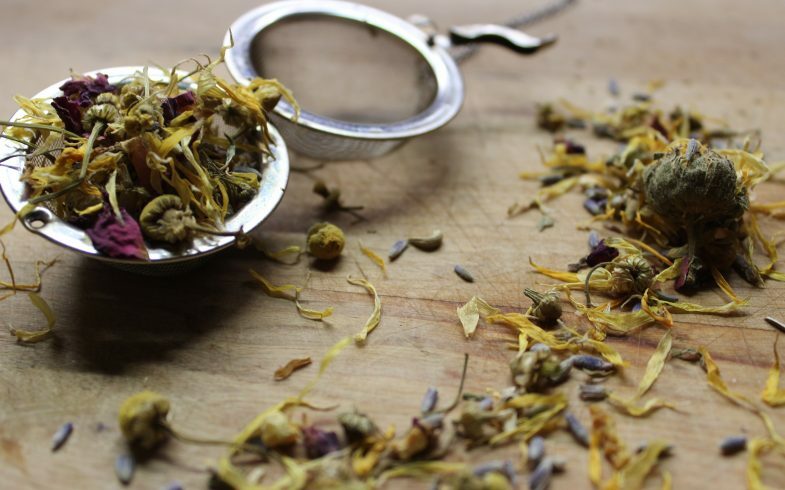 Though calendula is not specifically a calming herb it is a wonderful addition to a tea mixture if you’re coping with a lot of stress. It has been shown to help calm muscle spasms and has anti-inflammatory, anti-viral, and anti-microbial properties. As a bonus calendula has also been shown to improve oral health! While I generally add orange peels to my concoctions just for flavor they are loaded with vitamin C so you can keep your immune system in top shape. It’s not just the herbs though that I’ve found helpful, it’s the process. Filling the kettle with water and waiting for it to boil (no microwaves here! ), pulling out my favorite mug, carefully filling my tea basket with gorgeous flower petals, and sitting down mug in hand waiting for the tea to steep before finally drinking it absolutely helps. It’s a few moments of silence, of reflection, of not rushing off to the next project. It’s important. If you think your stress is out of hand or you have anxiety or depression you should talk to your doctor. But if you just need a little boost to handle life’s everyday hurdles making yourself a daily appointment with a cup of calming, quality, herbal tea may be just what you need. You got this.